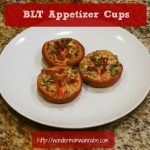 These BLT Appetizer Cups are delicious bite-sized portions of a sandwich favorite. They’re the perfect finger food for your next party. My favorite sandwich is a BLT, though I usually substitute spinach for the lettuce to pack in extra vitamins and nutrients. So, when I was trying to come up with some new appetizer ideas for our upcoming Super Bowl party, I decided to use the BLT as my inspiration. 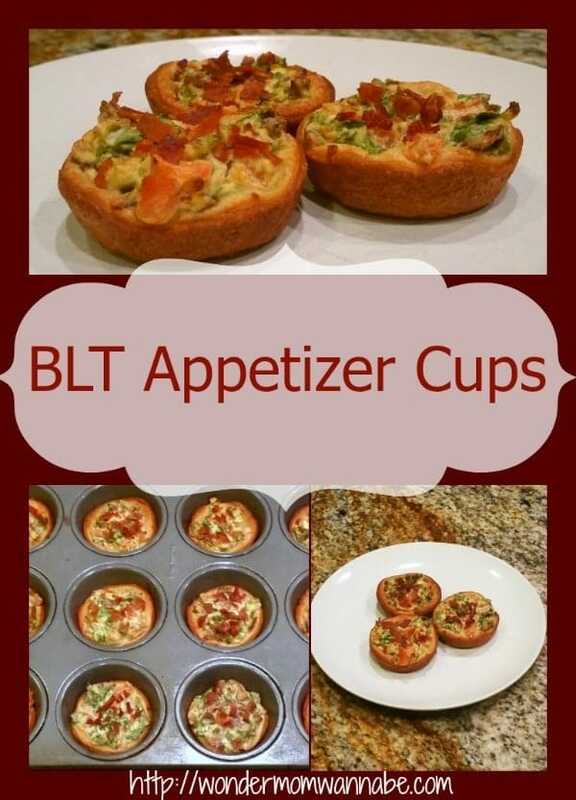 All the delicious flavors of a BLT in adorable, bite-sized cups. Preheat oven to 375°. Spray two muffin tins with cooking spray. Roll out crescent roll dough to make large, seamless rectangle. Using a biscuit cutter (or the rim of a drinking glass), cut out 24 circles from the dough. Press one circle into each muffin cup. Combine remaining ingredients in large mixing bowl and mix well. Divide mixture evenly between muffin cups. Bake at 375° for 11-13 minutes. These were a big hit with everyone in my family EXCEPT for my 12-year old son who hates cream cheese. So, I can’t promise that this will please the pickiest of eaters, but they’re sure to get scooped up by everyone else. Have you used a favorite sandwich or meal as inspiration for an appetizer before? Please share your ideas and recipes in the comments! Yes! They actually warm up great in the microwave. Wrap them loosely in a paper towel to hold in the moisture though so the dough doesn’t dry out and harden. Oooops. I hit post before putting my 5 Stars for this recipe! It was great for a party OR a special dinner for school aged kids! What a great appetizer! 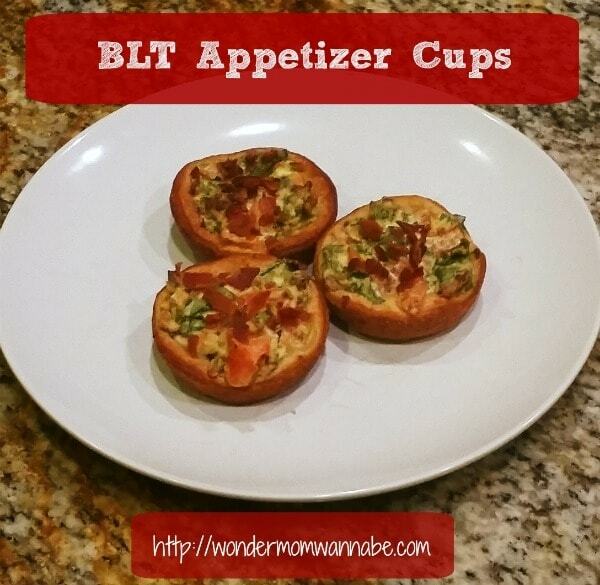 BLT is always a crowd pleaser and they were snatched up in a hurry. When it comes to quick and easy appetizers that are also finger-licking good – this one’s a winner! I plan to make this yummy recipe again (for the third time in a row!) for New Year’s Eve. First of all, you had me at “bacon”! These were incredible and devoured by my family! A few nights ago, my husband made the comment that he wanted BLTs for dinner. I guess that I have lead a sheltered life… I had no clue what they were. With a few quick internet searches, I determined they are not something I would ever eat. HA! However, those internet searches revealed these yummy looking bites. So, I printed the recipe and ran to the store. These are the perfect bite sized little snack. I think they would be great for a party or in a lunch. I agree! I feed them to my kids as a fun lunch. I froze some before cooking and I do like to pull them out and cook them in the toaster oven for a healthier, heartier snack once in awhile. If you ever make them, please stop back and let me know how you liked them and any changes you make to the recipe to make them better. You had me at bacon, but adding spinach cinched the deal! Sounds perfect for Super Bowl snacks.